Very funny. 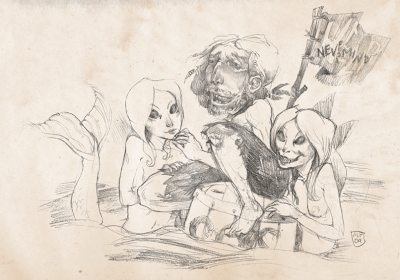 I love your mermaids, that is almost exactly how I imagine them. Know what? Those mermaids make me think of the various creepy visitors on the Courage the Cowardly Dog show... not exactly in their drawing style but in their, I dunno... vibe? Expression? Seems like a neat idea for a sketch group, BTW.